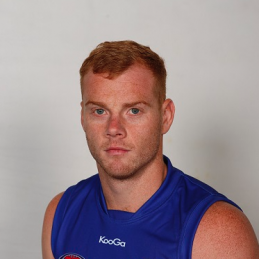 Adam Cooney selected by the Western Bulldogs with the number 1 pick in the 2003 AFL Draft. In his debut season he was instantly recognisable by his distinguished golden hair, something that was often the target by opposition players. After four years in the league he was regarded among the competition’s elite, culminating in winning the sport’s top individual award, the 2008 Brownlow Medal. Explosive at stoppages, this durable, goal kicking midfielder averages more than a goal a game and racking up score assists. Cooney featured in the 2009 national AFL advertisement, brushing aside a bull in a bullfighting ring.